Hepatocytes are the predominant cell in the liver, comprising about 60% of liver cells and 80% of liver mass. Hepatocytes are arranged in plates that branch and anastomose, or interconnect. Most hepatocytes have a single nucleus, but binucleate cells are common. There are approximately 1,000 mitochondria per hepatocyte. Approximately 15% of the cell volume consists of smooth and rough endoplasmic reticulum. There are about 30 lysosomes and 500 peroxisomes per cell. One of the main hepatocyte functions is the production of bile. Hepatocytes are also responsible for the regulation of metabolism, detoxification, and the manufacture of important circulating proteins, making them a critical component of studies involving liver disease, drug metabolism, and toxicology. Multi-well plates are used to screen drug candidates at varying concentrations with repeated measurements, generating a large number of data points for analysis and comparison. Multi-well plates need to be seeded with identical numbers of cells with known viability for correct interpretation of data. Due to hepatocytes’ variable morphology, fragile nature, and tendency to clump, traditional manual counting methods can be time-consuming and inaccurate. Because hepatocytes lose viability over time, extended or variable counting times can generate inaccurate and inconsistent viability determinations. Hepatocytes are too fragile to evaluate using flow cytometry due to flow-induced shear stress. 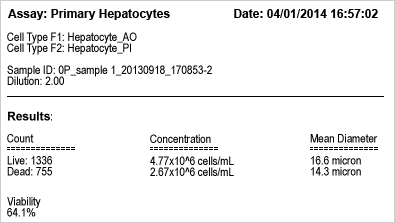 For viability determination, 20 µl of hepatocyte sample is mixed with 20 µl of ViaStain™ AO/PI Staining Solution. The acridine orange (AO) dye stains DNA in all nucleated cells, generating green fluorescence and easily differentiating hepatocytes from debris. Propidium iodide (PI) stains DNA in all cells with compromised cell membranes, generating red fluorescence. In cells stained with both AO and PI, the green fluorescence is absorbed by the red fluorescence via FRET (fluorescence resonance energy transfer), so all dead hepatocytes fluoresce red and can be easily counted. The procedure is fast, gentle, and accurate. Bright field image (left) shows the variable morphology of primary hepatocytes. Dual fluorescent image (right) shows counted live hepatocytes (circled in green) and counted dead hepatocytes (circled in red). Cell images and data can be instantly saved to a secure network or printed directly from the Cellometer software. Cellometer K2, Vision and Vision CBA instruments are ideal for researchers looking to perform accurate viability and concentration measurements of primary hepatocytes. Because of the fragile nature of primary hepatocytes, Cellometer Image Cytometers offer the best method for measuring cell viability while preserving the cell’s health.